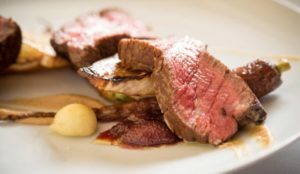 On Thursday, November 29, 2018, 7:00 p.m., Restaurant Nicholas in Red Bank, New Jersey, will treat diners to a special five-course menu that reflects the best of wild game and seasonal produce. The price of the special game dinner is $135.00 per person (plus beverages, tax & gratuity). For more information, or to make reservations, please call (732) 345-9977.